By default, each missing numeric value is represented in query results by a single period (.). This sample shows you how to use the PROC SQL CASE statement to define a data item expression that will return a 0 instead of a . for each missing value in the query results. This sample uses output from SASHELP.SHOES, which has been edited to include missing values for Sales. Specifically, in all of the Regions, boots were discontinued and therefore Sales are now missing for that product. Click the Full Code tab in this sample for code that generates the modified SHOES table. 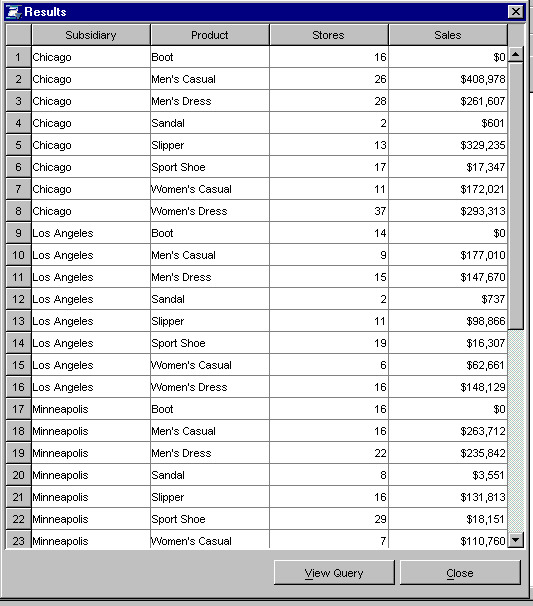 Click the Output tab in this sample to see the data in the modified table. 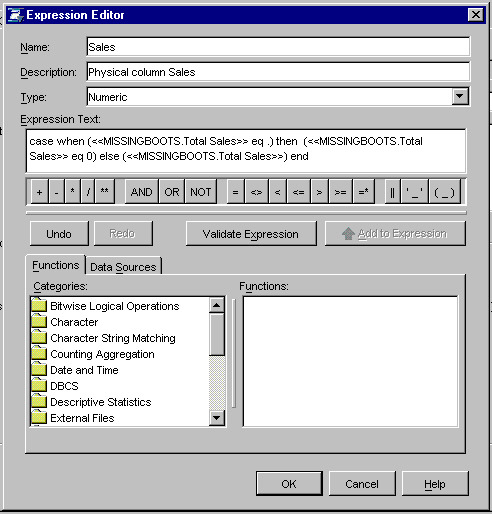 Open the Expression Editor for the data item. In this sample, the data item is Sales. Click OK to save the expression. Test the query to see the following results. The missing Sales values now display as $0. For a list of available documentation for SAS Information Map Studio, see http://support.sas.com/documentation/onlinedoc/ims/index.html. For more information about how SAS handles missing values, see the documentation for Base SAS at http://support.sas.com/documentation/onlinedoc/base/index.html. In the LIBNAME statment, replace '<your path>' with a valid path for your environment. This sample shows you how to modify a data item expression in an information map so that missing numeric values are displayed as zeros in query results.